Among the early creators of stencil-based street art in England, Nick Walkers work is characterized by his signature mix of nearly photo-realist stenciled elements alongside loose, freehand drawing. 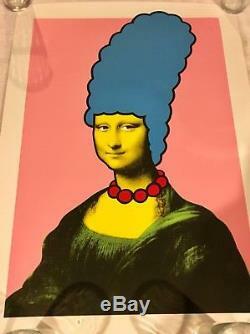 Seen here, the Walker blends two iconic images of Western history, Marge Simpson from Matt Groening's long-running animated series, The Simpsons, and Leonardo da Vinci's immortal "Mona Lisa, " a juxtaposition that perpetuates the dialogue on high versus low art. Work: 29 x 21.5 in (73.66 x 54.61 cm) - Image size: 27 x 19.5 in. Frame: 30.5 x 22.5 x 1.5 in (77.47 x 57.15 x 3.81 cm). Signed on lower right, recto; numbered on lower left, recto. 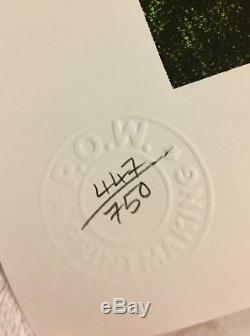 The item "Nick Walker Mona Simpson Original POW Signed Rare Limited Edition 447/750" is in sale since Tuesday, March 27, 2018. This item is in the category "Art\Art Prints". The seller is "nuspun2020" and is located in Tulsa, Oklahoma. 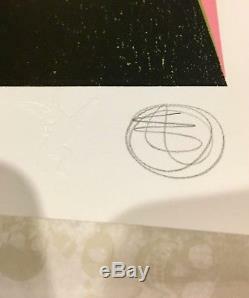 This item can be shipped to United States, Canada, United Kingdom, Denmark, Romania, Slovakia, Bulgaria, Czech republic, Finland, Hungary, Latvia, Lithuania, Malta, Estonia, Australia, Greece, Portugal, Cyprus, Slovenia, Japan, Sweden, South Korea, Indonesia, South africa, Thailand, Belgium, France, Hong Kong, Ireland, Netherlands, Poland, Spain, Italy, Germany, Austria, Israel, Mexico, New Zealand, Singapore, Norway, Saudi arabia, Ukraine, United arab emirates, Qatar, Kuwait, Bahrain, Croatia, Malaysia, Colombia, Panama, Jamaica, Barbados, Bangladesh, Bermuda, Brunei darussalam, Bolivia, Ecuador, Egypt, French guiana, Guernsey, Gibraltar, Guadeloupe, Iceland, Jersey, Jordan, Cambodia, Cayman islands, Liechtenstein, Sri lanka, Luxembourg, Monaco, Macao, Martinique, Maldives, Nicaragua, Oman, Peru, Pakistan, Paraguay, Reunion, Bahamas, Viet nam.